Let’s face it, sometimes we are just having an off day, with bad hand after bad hand. And sometimes, surrendering is our best bet; an occasionally viable tactic in games of blackjack which allow the player to do so. 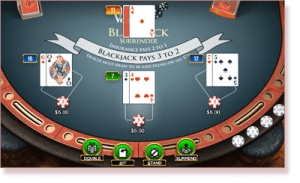 Surrendering, as we explain in our glossary of blackjack terms, refers to the offer in some games styles of blackjack (mainly American versions) which allows players to forfeit their hand in the current round and get back half of their original wager. The option to do so is offered by some land-based casinos, and the majority of online casinos. If you have a hard hand of 14 and the dealer has an Ace on show, surrendering in order to retrieve half of your bet instead of quite possibly losing it all can be appropriate. Surrendering is a feasible option if you are dealt a poor hand and the dealer has a strong hand, but it has to be used in the right situation. Otherwise, it’s money down the drain that could have won. Surrendering is only available as a first decision of a two-card hand. It is usually only offered in hole-card games (but see below for variations), where the dealer draws two cards and may or may not peek at the hole (face down card), before players make their decisions. But in general, surrendering will usually only be available directly after the dealer has checked for blackjack. The variations we speak of are early and late surrender. Late surrender, explained above, refers to being able to do so in hole card games, only after the dealer has checked for a blackjack. It is the most common option at all types of casinos. If the dealer checks and does indeed have a blackjack, surrendering is thus made unavailable. Alternatively, early surrender is when you are allowed to surrender before the dealer checks (or if the dealer doesn’t check at all) for blackjack in hole-card games, or in a no-hole-card game, where the dealer does not draw a second card until all players have acted. As you can see, early surrender is significantly more favourable to the player than late surrender is, which is why early surrender is not often available. As mentioned above, surrendering can be an appropriate play if used at the right time. It may seem like a cowardly move which is not progressive or beneficial in the long-run, and it is if not used correctly: you’re wasting hands that have the potential to win. Only consider surrendering as a last possible resort on the very worst hands. There are only a few hands in which surrendering can be considered (late surrender). If you are lucky enough to be playing with the rare early surrender option, this allows for more flexibility and you might consider surrendering medium to low strength hands if the dealer holds an Ace (and the hole-card has not yet been examined). You hold a total of 12 to 17 against a dealer’s Ace. You hold a total of five to seven against a dealer’s Ace. You hold a total of 14 to 16 and the dealer has a Ten. You hold a total of 16 and the dealer shows a Nine. Your hand totals a hard-15 and the dealer holds a 10-valued card or an Ace. 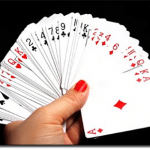 Your hand totals a hard-16 and the dealer holds a Nine, 10-valued card or Ace. Your hand totals a hard-17 and the dealer holds an Ace. 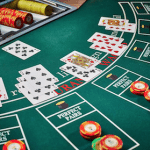 At most land-based casinos, BJ tables will have rules on a placard for players to view, but it is still worth confirming with the dealer before playing, just to make be certain surrendering (or any other option for that matter) is available. Online casinos will typically label each game with the available options which can be checked before, during and after play. To surrender at an online table, click the corresponding surrender button. To do so at a land-based BJ table, wait until you have the dealer’s attention after receiving your cards, and verbalise your intentions (with a possible follow-up hand signal). There is no standard hand signal for surrendering, but players will usually move a finger from right to left on the table above their cards (drawing an imaginary line). We suggest making your surrendering intentions clear by first saying so, because signalling a surrender with your hands can be sometimes be misinterpreted as a hit, so verbalisation is really the best way to go. Once recognised, the dealer will remove your cards from the table, take half your bet and return the other half to you. Essentially, you have forfeited the opportunity to play out your hand and the casino keeps half of your bet while the other half acts as a push/stand-off/tie; whatever you want to call it.